This weekend a BBQ contest will take place that should not be missed. Competition barbeque teams will be cooking chicken, ribs and tri-tip all in hopes of winning the coveted title of Grand Champion. The public is invited to sample mouth watering, award winning barbeque. This event promises to be so much more than just a cook-off. It will be held at the Feather Falls Casino in Orville, California. After you have had your fill of great BBQ there is a casino with plenty of opportunities to make your fortune. An in house microbrewery will provide plenty of fresh, tasty and cold beers. Later in the evening, Elvin Bishop will perform. This is going to be fun. We hope to see you there. Three Dogs BBQ, If you were closer you might even compete. 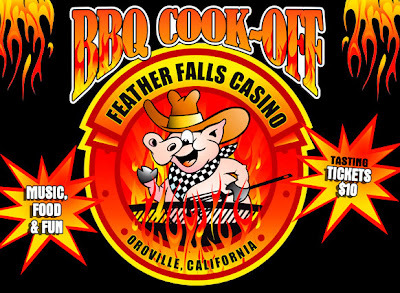 This is not a KCBS contest but should be a blast. We might even see Elvin Bishop. I saw Elvin Bishop once. At Winterland, this was so long ago. Heart was also playing. I heart Heart. cookiecrumb, I remember Winterland very well. I actually saw the ice follies there too. I saw Heart at the Oakland Auditorium. The Auditorium was a good venue. We may see Elvin Bishop Saturday. We shall see. Sweet! Have a great time. Sounds like a fun event. We judged our first today, interesting experience!